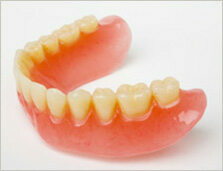 Dentures also known as false teeth help to replace missing teeth. Full dentures replace all teeth. 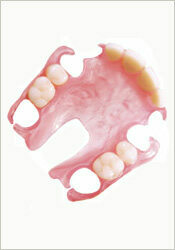 Partial dentures replace one to multiple missing teeth. They are removable. You can eat with them and they help to stabilise your mouth as well as provide an aesthetic balance. They are considered the least expensive option when replacing missing teeth. Q. What types of dentures are there? As the name suggests, a partial denture replaces one to multiple missing teeth in either or both the upper or lower arch. Sometimes they are required in one arch simply for appearance. More often it is required to improve chewing ability, or to prevent remaining teeth from drifting or over erupting. They can also reduce wear and tear of your remaining teeth because chewing and grinding forces are more evenly distributed. 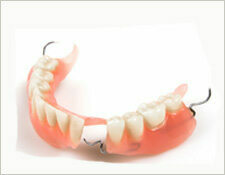 Valplast partial dentures are flexible, light weight, translucent, clinically unbreakable and require no metal clasps. They are retained via the undercuts of your teeth. They are made from an injected thermoplastic nylon. Because they are translucent, it allows for your natural gum colour to come through. As a result, they are very aesthetic and comfortable to wear. Chrome partial dentures have a cobalt chrome base with an acyrlic body that supports the teeth. These are generally thinner and smaller in the mouth, compared to plastic partial dentures and offer great strength, stability and support for the remaining teeth. Because of the rigid frame, it is also possible to transfer bite forces to the remaining teeth, rather than the supporting gums, by the use of metal rests on the occlusal surface of the supporting teeth. Acrylic partial dentures are made entirely of acrylic with metal wires for retention. They are the cheapest of the 3 options. They are easy to repair, reline, and further teeth can be easily added. This option is advised where your remaining dentition is doubtful or tooth loss is expected. Most acrylic dentures will have wires for retention, but in some cases these wires may not be necessary. Full dentures as the word implies are acrylic appliances that replace all the teeth in one or both arches. They are supported by surrounding soft and hard tissues of the oral cavity. At Just Dental Care, we are fortunate to have Michael Hearsch, a qualified Prosthetist, to oversee both the clinical and laboratory work for all our full dentures. Michael will be available on site when required.